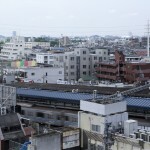 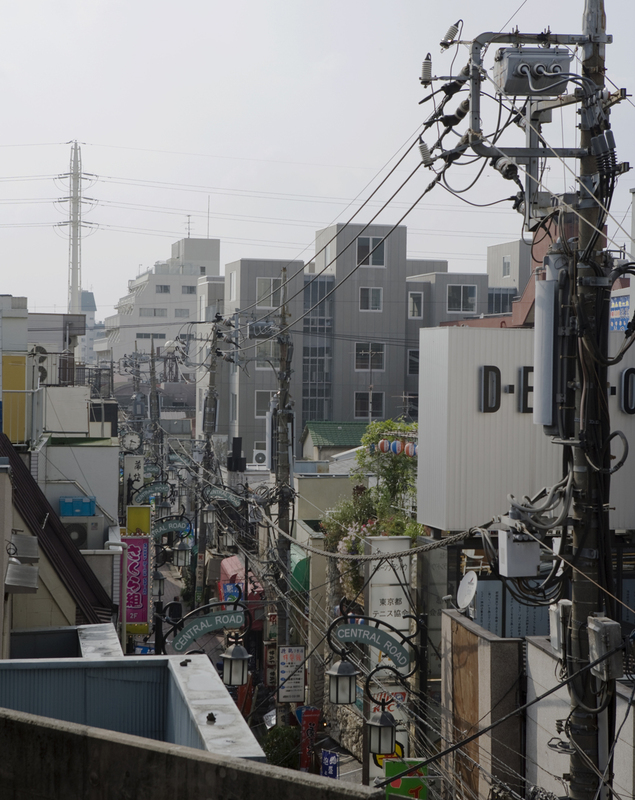 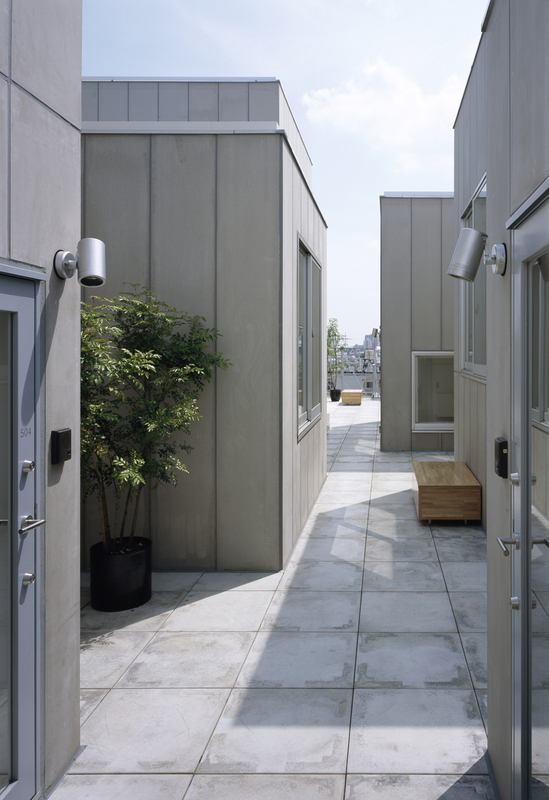 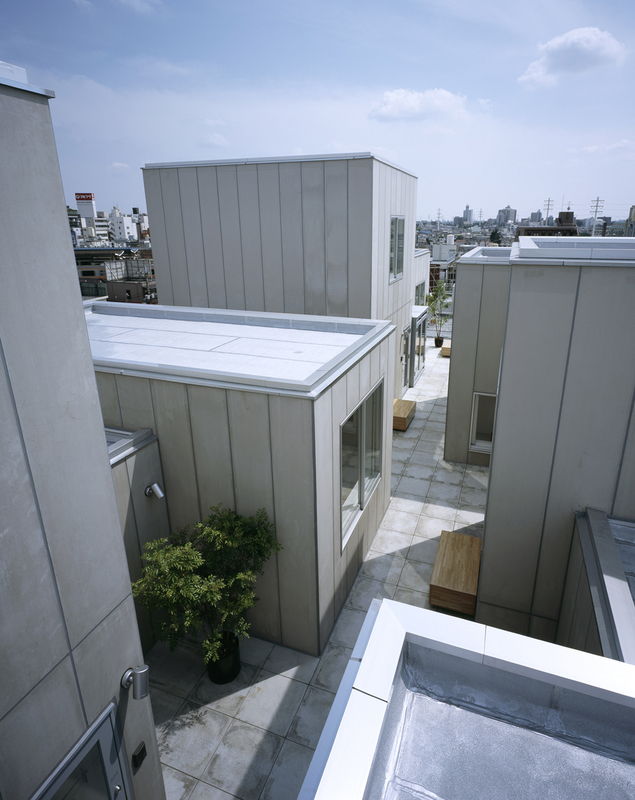 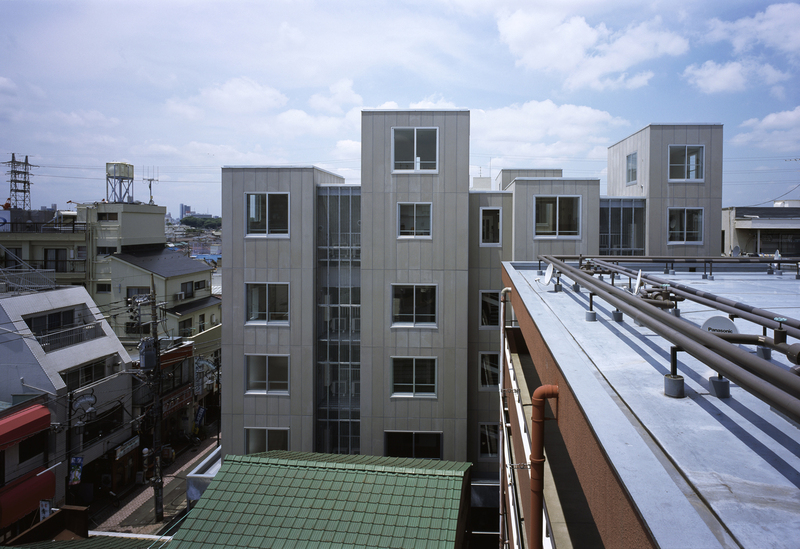 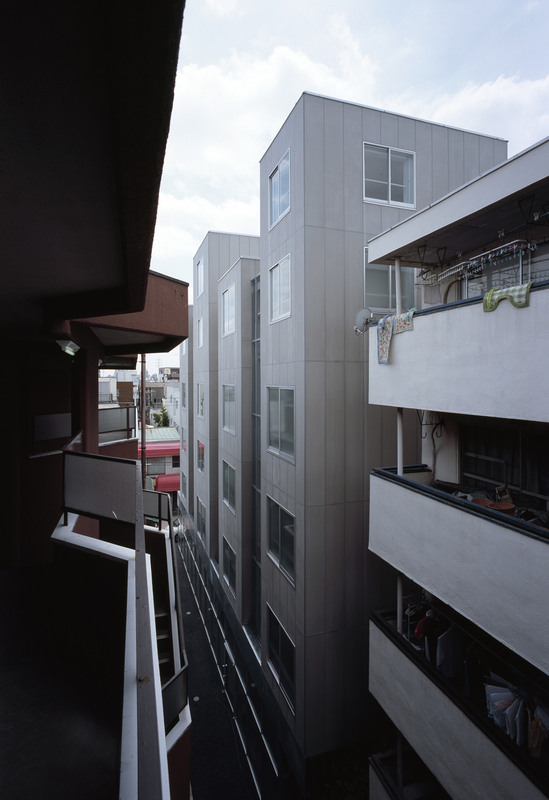 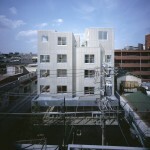 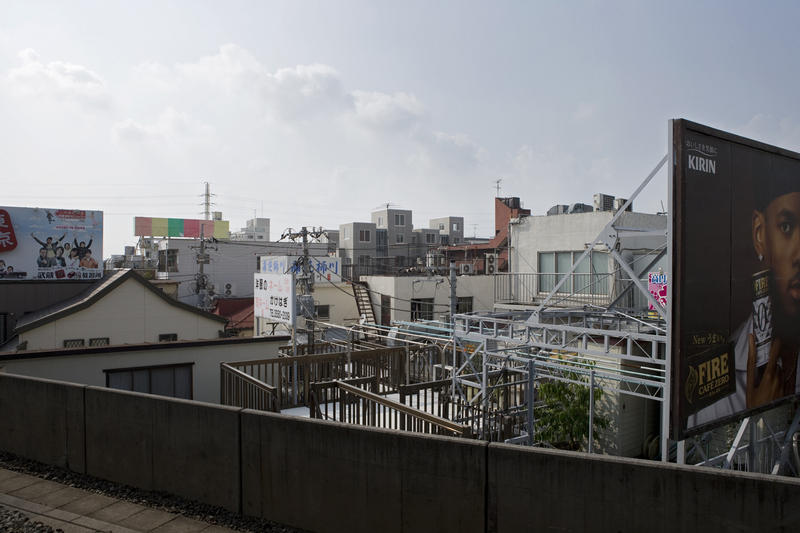 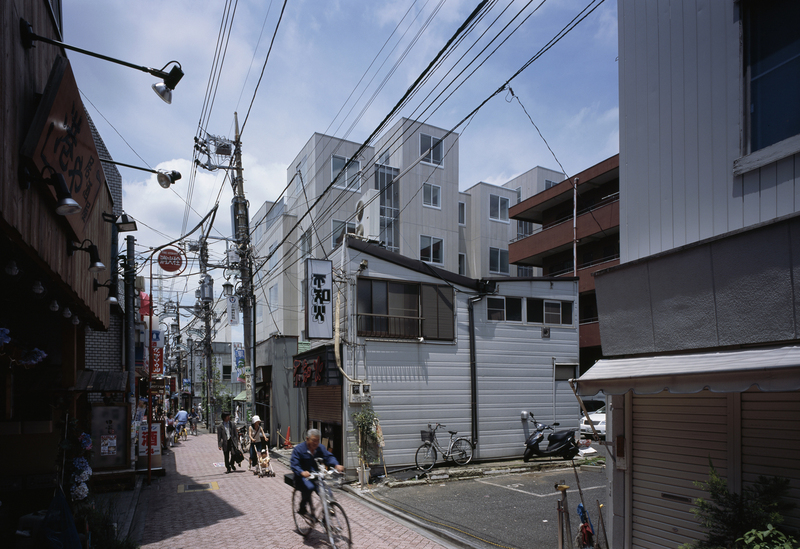 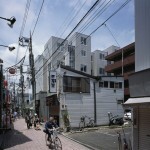 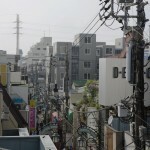 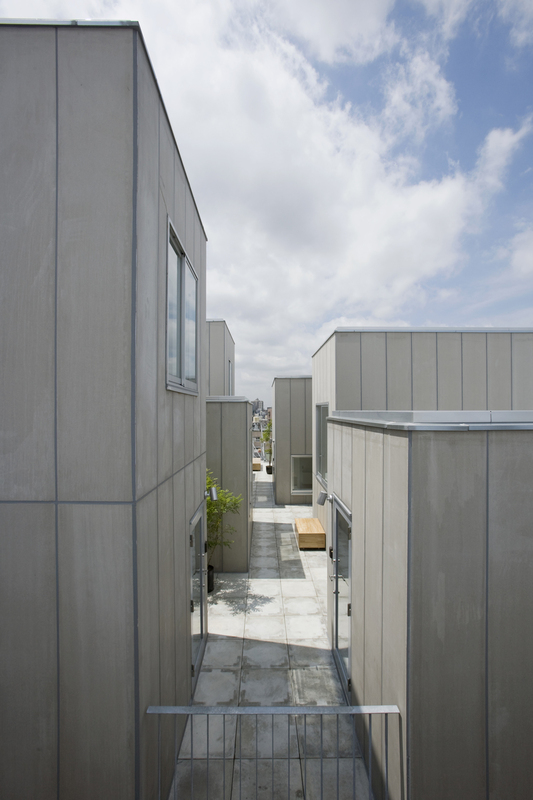 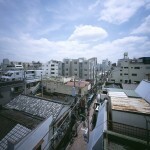 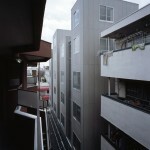 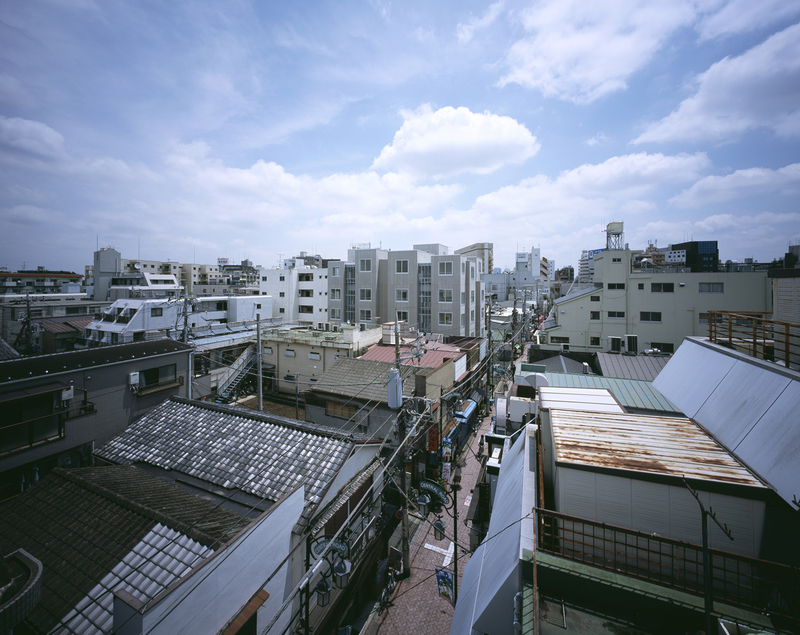 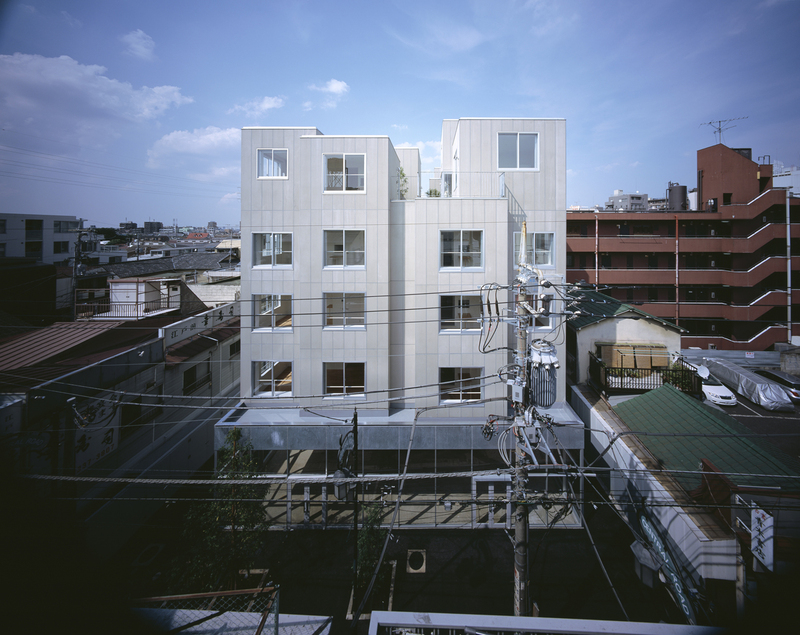 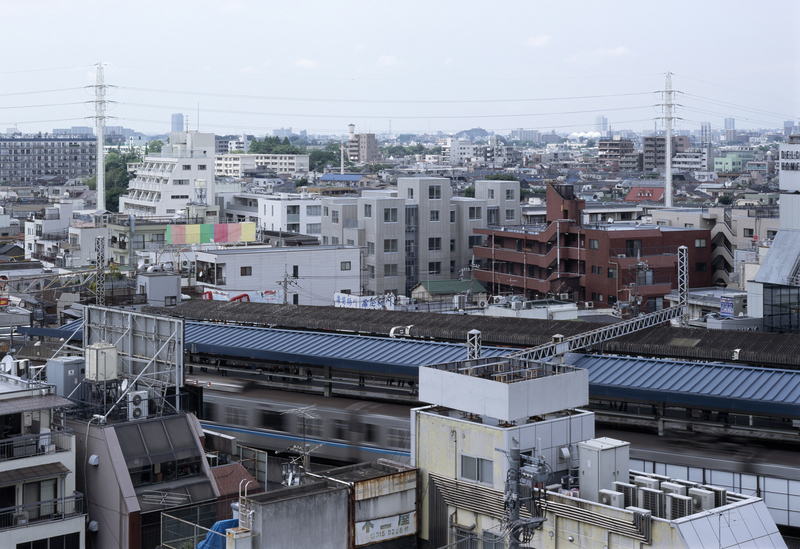 This is a building complex including housing and a shop, built near a station in the downtown of Tokyo. 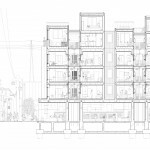 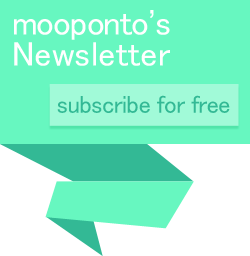 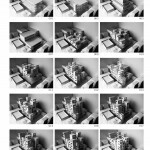 As the answer for the following two problems; how we can fit the volume of 1300 m² to the human-scale street, and what space we can prepare for the life style of a one-room apartment. 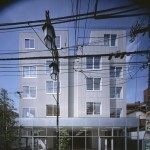 We suggested the building shaped with several towers on the glass box base. 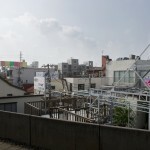 Usually, rooftop and surround space of urban building tend to be covered with equipment machines and pipings, however, in this building by integrating all of them in the 5 service-spaces, rooftop and outside space got the place for their daily life. 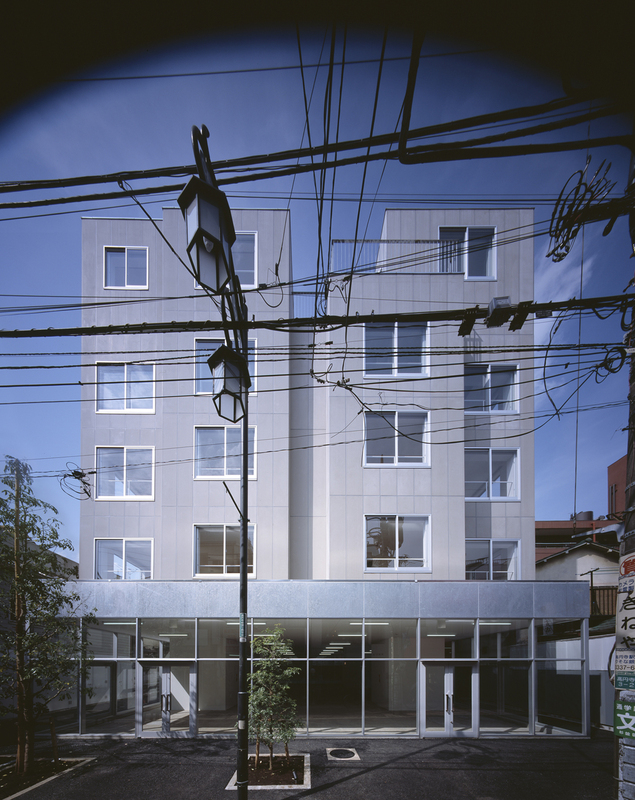 In this project, we tried to improve the sustainability by putting the planning of facilities on the core of design scheme, which is the weakest part of buildings on a long-term basis. 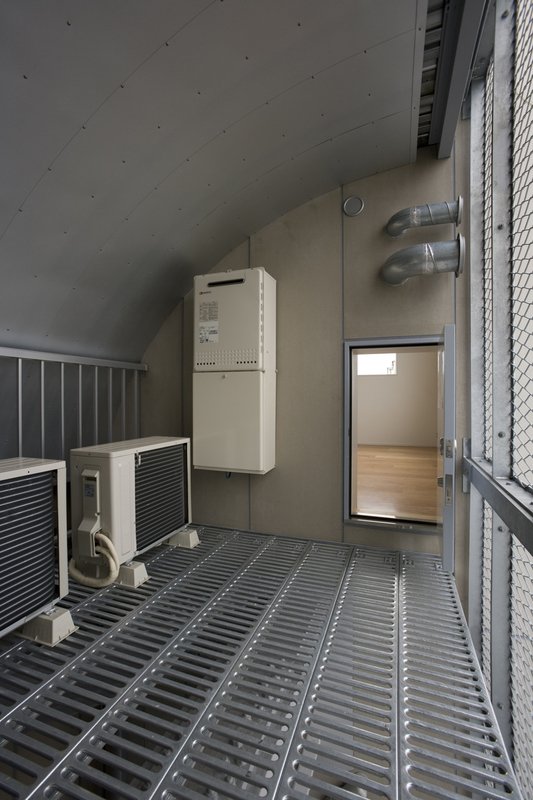 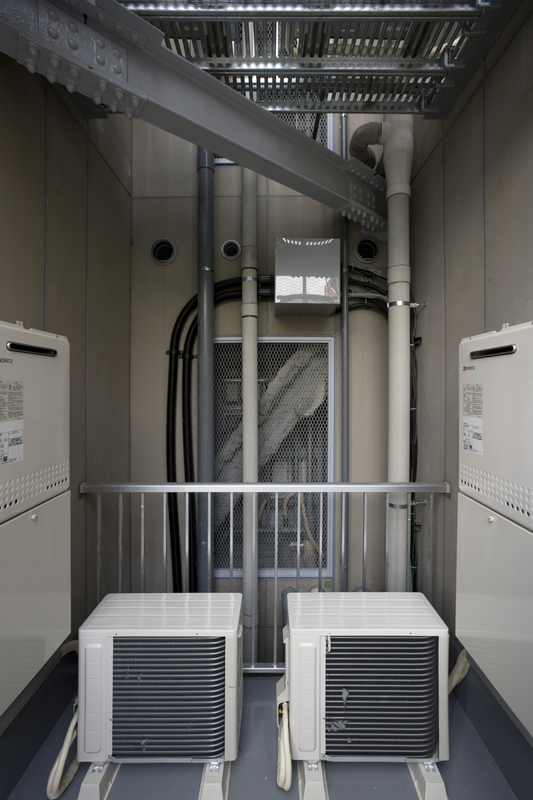 While apartments usually reveal many equipments (for example, air conditioning units, gas boilers, pipes for water supply and drainage, cables, facilities for air supply and drainage, etc. 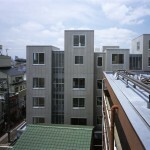 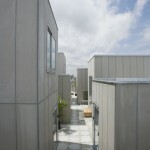 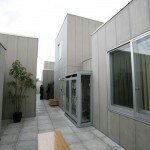 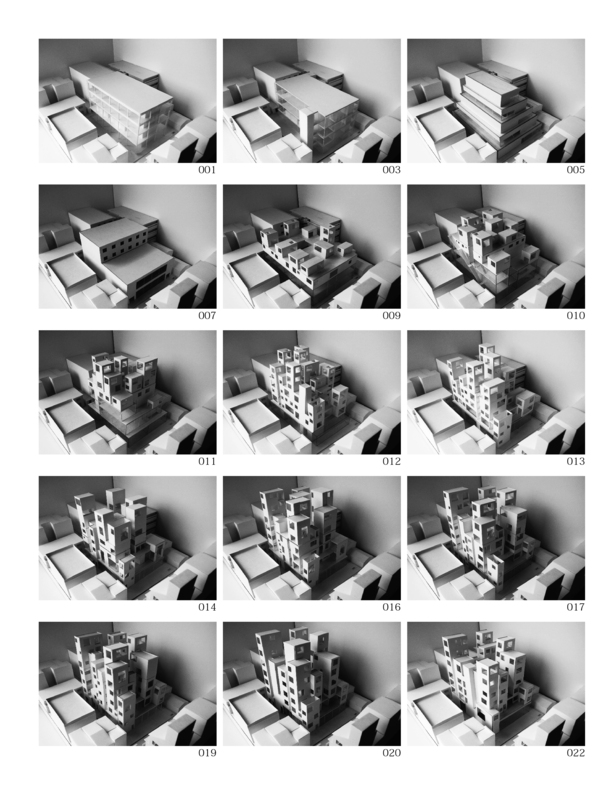 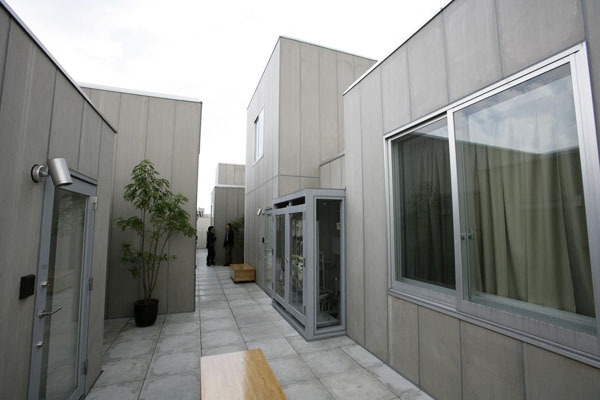 ), this building simply secures them in the 4 core-spaces. 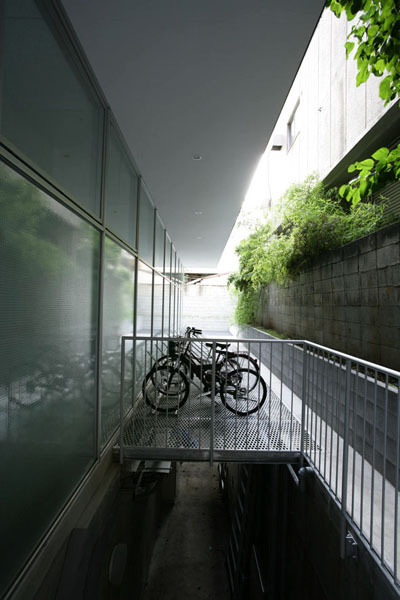 By the large space enough to integrate them, no facilities are seen on the surface, and we can easily maintain and exchange them. 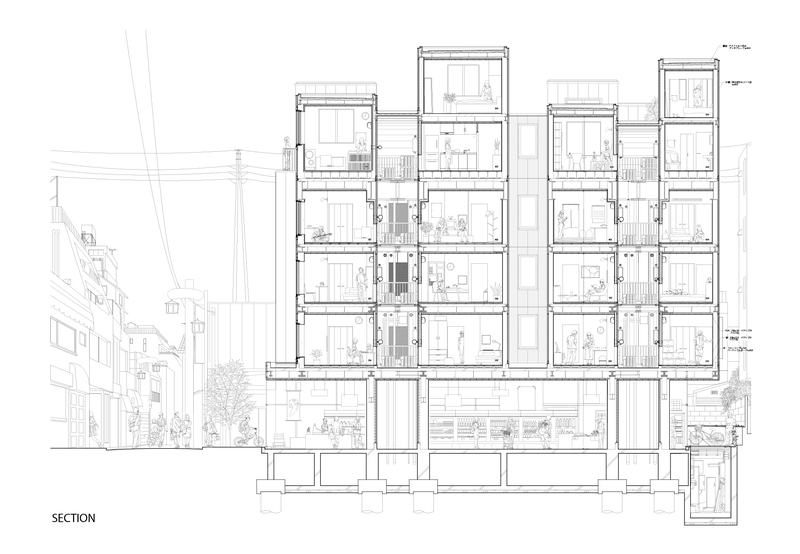 The point of its structure is that a mega-structure system is introduced, which makes the 5th floor into a mega-floor constructed with big beams and it hangs the 2-4F floors down. 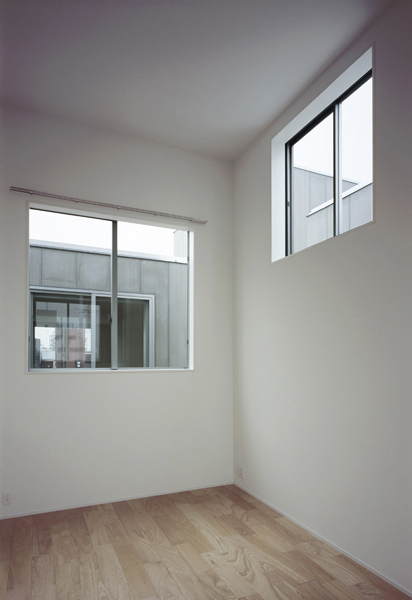 In this way, in the 1st floor columns are not seen anywhere, and in 2-4 floors there are not the shape of columns as the result of its hanging floors (the columns can be 65-mm × 65-mm parts, and we put them into 120-mm dry wall). 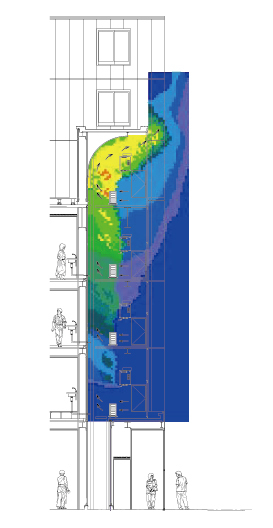 This total composition in which the engineering of design, facilities and structure are organized together is realized by the cooperation with the specialists of facilities and structure from the very early phase of the design process. 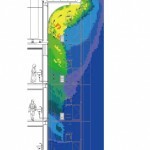 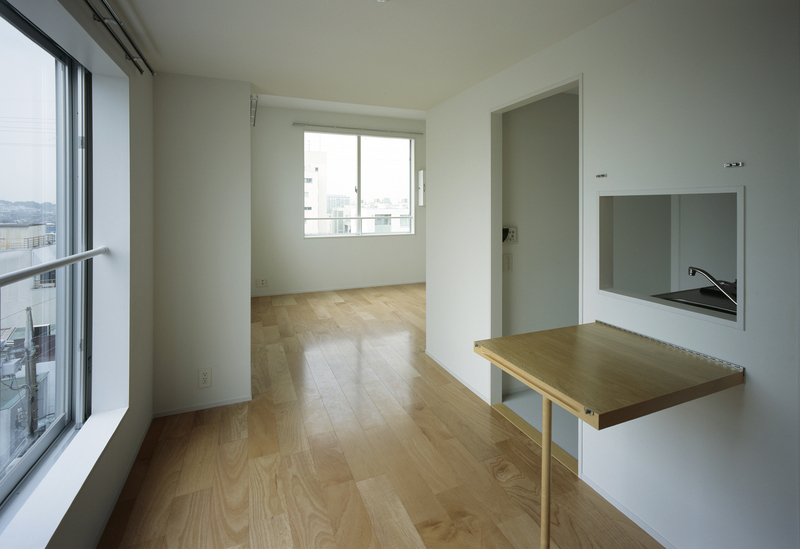 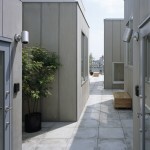 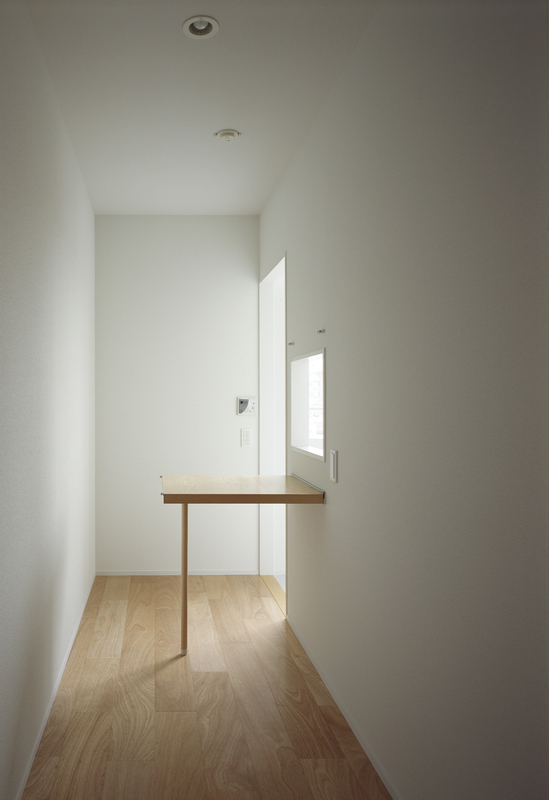 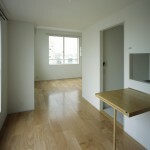 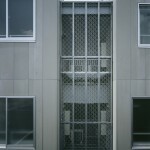 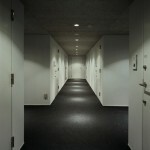 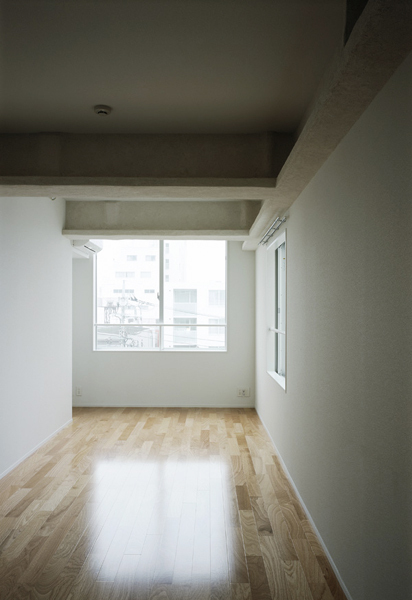 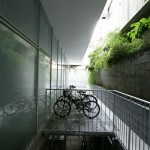 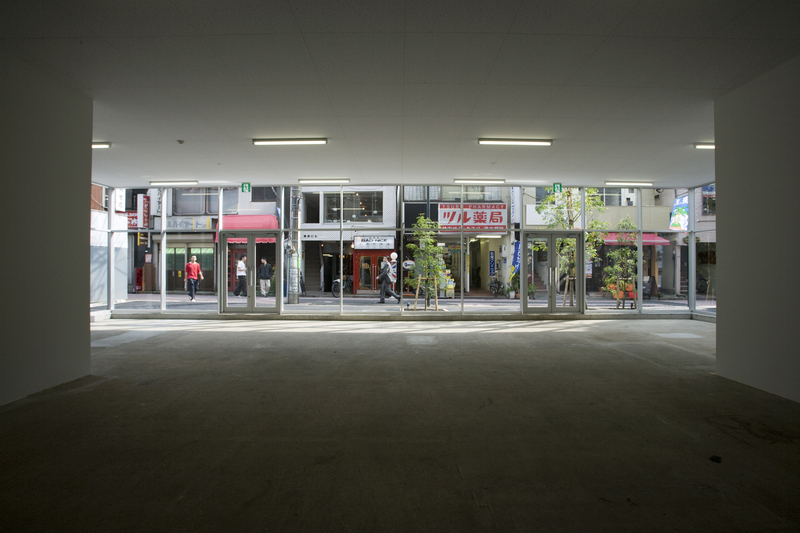 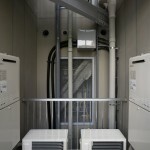 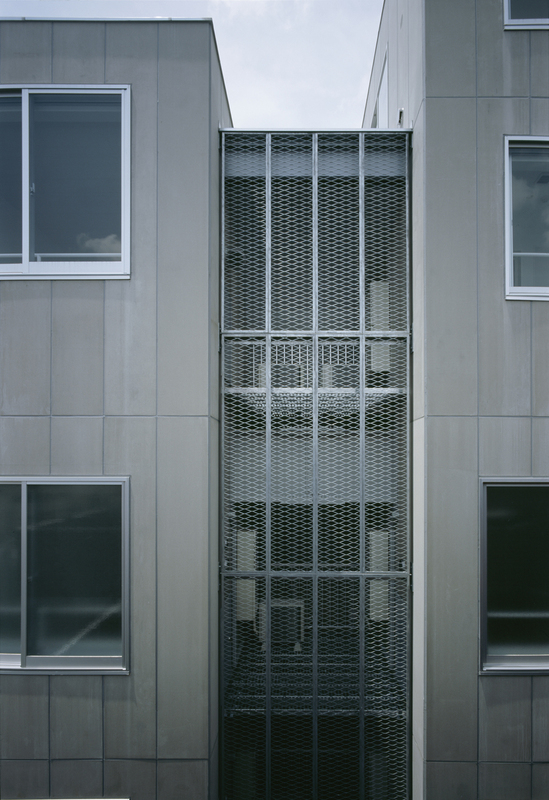 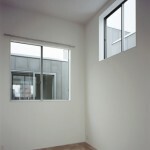 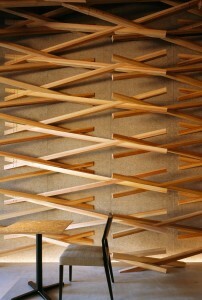 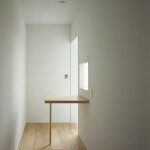 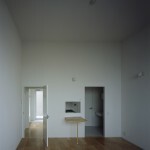 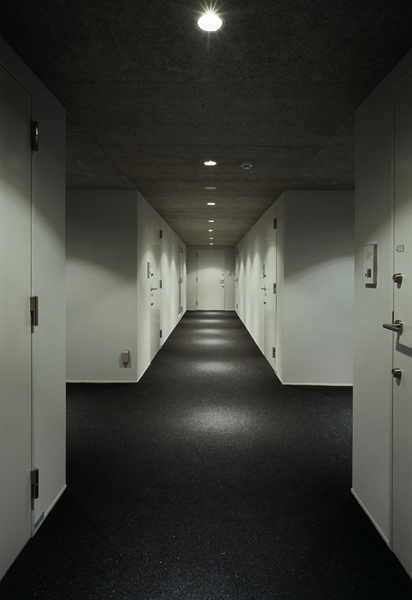 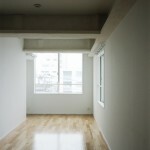 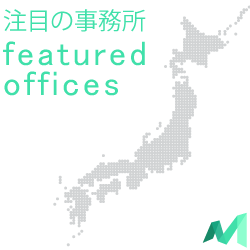 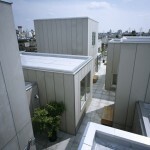 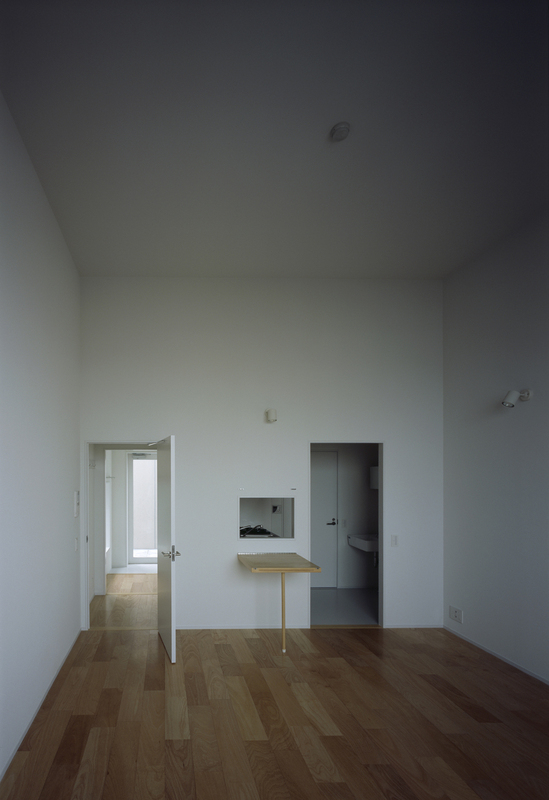 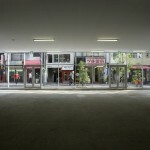 facility planning: Kankyo Engineering Co., Ltd.
general contractor: Maruzen Co., Ltd.